Robert Millikan received the Nobel Prize in 1923 for the spectacularly designed ‘oil drop experiment’. A fine mist of oil was sprayed from an atomizer. Most of the droplets get negatively charged as they picked up a small, unknown number of electrons as they passed through its nozzle. Some of the drops then fell through a hole in the top plate and drifted into the region between two parallel plates between which a variable electric field had been established. Lit from the side by an intense light, these drops glistened when the region was viewed through a horizontally mounted microscope focused off the falling drops. Once a drop was located, the voltage was varied thus controlling the electric field, E, to slow down the drop’s descent. When the drop reached terminal velocity (weight downwards mg = electrostatic force upwards EQ) it was tracked through the remainder of its fall and a ratio of mass per unit charge was recorded. Drops either drifted upwards or downwards at a steady speed, or remained at rest in the electric field. A simpler version located a stationary drop at a particular voltage thus doing away with the need for complicated viscosity equations as it fell. assuming the drops are of equal mass…Millikan himself used viscosity determinations to establish the drop radius. Knowing the density of the oil, he could find the mass of the drop. For our purposes, let’s assume a constant mass. Voltage between the plates for a particular stationary droplet is therefore inversely proportional to the charge on the droplet. 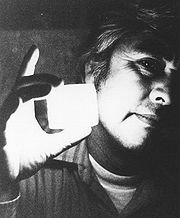 Millikan found that the voltages required went up or down in predictably sized jumps, consistent with a quantised charge on the electron. The whole deal is a bit more formal than this, but you get the idea…. Welcome to the greatest free show on earth. Take a look at this (sorry about the music..) These spectacular images, named after the Roman goddess of dawn are called auroras, both surrounding the north magnetic pole (aurora borealis) and south magnetic pole (aurora australis). They occur when fast moving electrons from the solar wind interact with elements in the earth’s atmosphere. Solar winds, plasmas of charged particles, stream away from the sun at speeds of about 1 million miles per hour. When they reach the earth, some 40 hours after leaving the sun, they follow the lines of magnetic force generated by the earth’s core and flow through the magnetosphere, a teardrop-shaped area of highly charged electric and magnetic fields which protects us from the wost ravages of the solar wind. As the electrons enter the earth’s upper atmosphere, they encounter atoms of oxygen and nitrogen at altitudes from 30 to 300 km above the earth’s surface. 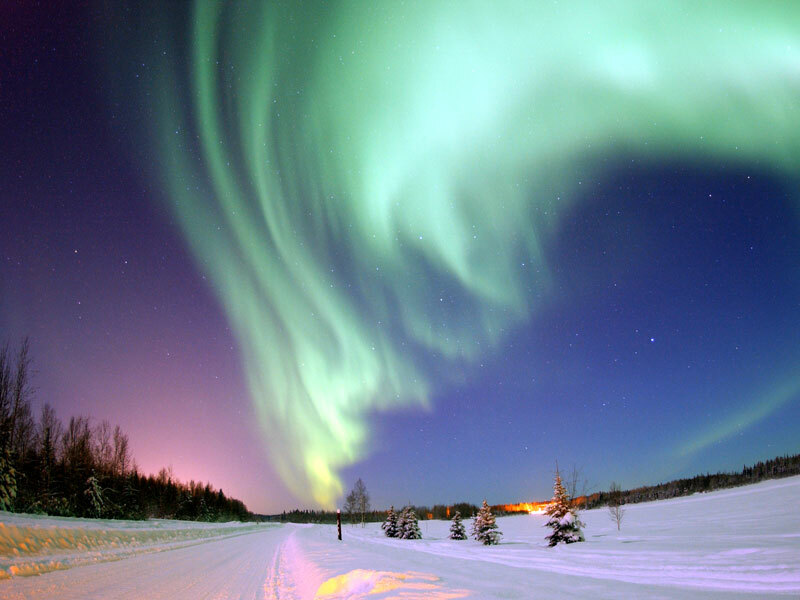 The color of the aurora depends on which atom is struck, the exact excitation event and the altitude of the meeting. The magnetic and electric forces interact with one another in constantly shifting combinations. These shifts and flows can be seen as the auroras “dance,” moving along with the atmospheric currents that can reach 20,000,000 A at 50,000 V. By comparison, the circuit breakers in your home will disengage when current flow exceeds 15-30 amperes at 240 volts. 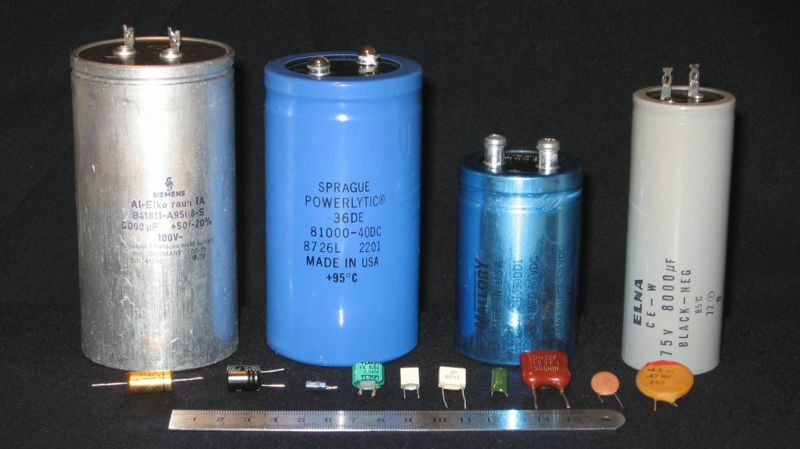 A few capacitors – lots of different sizes. Big ‘swiss-roll’ ones mean greater parallel plate area and smaller plate distance thus larger capacitance. Some have to be connected the right way round – called electrolytic capacitors. Here’s why. One way to make a large capacitor is to take two long strips of aluminium foil (=large plates), put strips of isolating materials between them, and make a nice compact swiss roll. Capacitors up to around 1MF can be made this way, but they are physically big, so if we want even higher capacity, we need to look for other things than plate area. It happens that we know of a very thin and very voltage resistant type of isolation material: Aluminium oxide. If we cover a strip of aluminium foil with a thin oxide layer, we have one plate and a very thin dielectric. Problem now is to make the other plate come close enough to the other side of the oxide layer. The thing that comes really close is a liquid, so if we submerge our oxide covered plate in a conducting liquid, the liquid forms the other plate, and we can make a very large capacitor. A conducting liquid is called an electrolyte, see? The oxide layer is made by an electrolytic process; the foil is submerged in some liquid and current is passed through the liquid into the metal, forming the oxide layer. This is an advantage and a disadvantage: The good news is that the dielectric layer has self-healing capabilities, so if a weak spot occurs, the resulting leakage current will more or less rebuild the isolation. This is the reason electrolytic capacitors can regenerate if you raise the voltage over them slowly. The bad news is that the process is reversible! If you reverse the polarity, even the slightest leakage will begin to tear the dielectric down, resulting in more leakage, which tears away more dielectric, which… well, you get the picture. This is the reason you need to observe polarity strictly when using electrolytic capacitors. Here’s a little applet to show how a capacitor charges and discharges for those who like it simple..
Here’s a bottom-up capacitance tutorial. Almost everything we need to know and more is here.….pick and choose what you need. No integration is necessary, but, if you can follow the maths, so much the better. Finally, years ago, when I was a boy, there was radio. 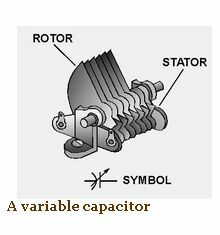 We had a gizmo on the front called a tuner, a twiddly thing which changed the plate overlap and hence the capacitance of a variable capacitor. 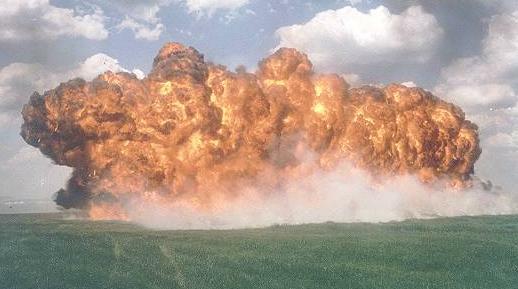 Looked like this…. 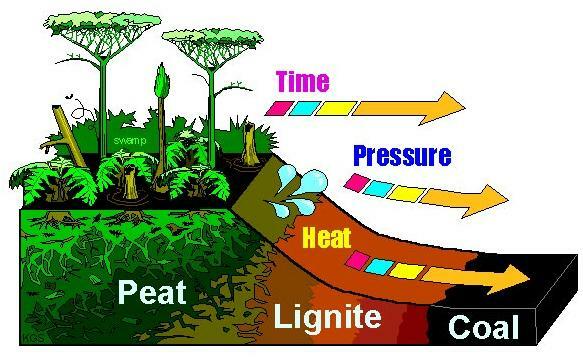 Like oil and gas, coal is a fossil FUEL which means it can be burned to generate heat energy. 300 million years ago, it was the Carboniferous Age on Earth. The land that had emerged from the sea was covered with enormous forests. In certain places, these forests were submerged underwater at regular intervals beneath the sea or marshes. The wood, instead of rotting on the surface, was rapidly covered with mud and sand. Over thousands of years, the forest took over again, and then it was submerged as before, and so on. Little by little, the sediments carried by rivers or the sea covered these layers of dead wood, gradually hardening into lignite. As these sediments built up, the wood sank deeper and deeper into the ground. We know that the further we go down into the earth, the hotter it becomes. This heat and the enormous pressure of the sediments gradually transformed (over time) the wood into coal. Oil is another fossil fuel. It was also formed more than 300 million years ago. Some scientists say that tiny diatoms are the source of oil. Diatoms are sea creatures the size of a pin head. They do one thing just like plants; they can convert sunlight directly into stored energy. As the diatoms died they fell to the sea floor (1). Here they were buried under sediment and other rock (2). The rock squeezed the diatoms and the energy in their bodies could not escape. The carbon eventually turned into oil under great pressure and heat. 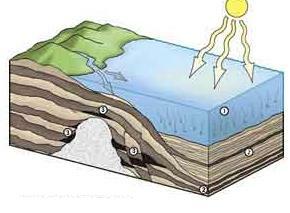 As the earth changed and moved and folded, pockets where oil and natural gas can be found were formed (3). Oil has been used for more than 5,000-6,000 years. The ancient Sumerians, Assyrians and Babylonians used crude oil and asphalt (“pitch”) collected from large seeps at Tuttul (modern-day Hit) on the Euphrates River. A seep is a place on the ground where the oil leaks up from below ground. The ancient Egyptians used liquid oil as a medicine for wounds, and oil has been used in lamps to provide light. The Dead Sea used to be called Lake Asphaltites. The word ‘asphalt’ – the stuff we put on roads -is derived from this place because of the lumps of gooey, jelly-like black oily gunge that used to be washed up on the lake shores from underwater seeps. Titrations can be used to find the concentration of an acid or alkali from the relative volumes used and the concentration of one of the two reactants. You should be able to carry out calculations involving neutralisation reactions in aqueous solution given the balanced equation or from your own practical results. NB: 1dm³ = 1 litre = 1000ml = 1000 cm³, so dividing cm³/1000 gives dm³. 1 mole = RMM (formula mass) in grams. In most volumetric calculations of this type, you first calculate the known moles of one reactant from a volume and molarity. Then, from the equation, you relate this to the number of moles of the other reactant, and then with the volume of the unknown concentration, you work out its molarity. Example: Given the equation NaOH(aq) + HCl(aq) → NaCl(aq) + H2O(l) – you need to do this first if it isn’t given to you so you can calculate molar ratios of reactants. 25 cm³ of a sodium hydroxide solution was pipetted into a conical flask and titrated with 0.2M hydrochloric acid. Using a suitable indicator – phenolphthalein is good – weakly basic is fuchsia pink and acidic is colorless – it was found that 15 cm³ of acid was required to neutralise the alkali. Calculate the molarity of the sodium hydroxide and concentration in g/dm³. 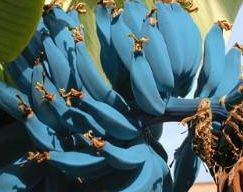 Bananas look blue in ultraviolet light. The colouring might be due to the breakdown of chlorophyll – the stuff that makes plants look green -as the fruit ripens. Some animals can see in the shorter wavelength UV, so it might be a means of attracting them. Would you eat a blue banana? Conduction- heat transfer in space? Space is really cold, just over 2.75K, a whisker above absolute zero. Things contract when they get cold and expand when they get hot. Re-entry causes friction between the space shuttle orbiter and the atmosphere and friction produces heat – rather a lot of it. Also, we need to keep the weight down as much as possible. So, what can we do to protect the shuttle? Aluminium is light but can’t handle temperatures above 175°C, so it really needs some heavy-duty protection. Much of the shuttle is covered with silica tiles made from essentially very pure quartz sand. The insulation prevents heat transfer to the underlying orbiter’s aluminium skin and structure. These tiles are such poor heat conductors that you can hold one while it is still red hot. There are about 24,300 tiles individually fitted on the vehicle, so the orbiter has been called “the flying brickyard”. The picture shows a white hot 1260 °C silica tile material being safely hand held 10 seconds after removal from a high temperature oven.